I looked around my house this week to find something red to join the Rednesday Party at It's A Very Cherry World and I came up with this little set. The book and the little hand made bears are all from garage sales. I just couldn't pass up that sweet little Mama Bear. And you know I love vintage children's books. I had to take down my red and white enamel ware from above my cabinet, so I could get ready to paint this week. That should be the last step of the kitchen re-do. I took all the pieces down and cleaned them. Now I can rearrange them when I put them back up. I weeded out some others and decided to concentrate on coffee pots and tea pots. How many of you collect enamel ware and what colors do you collect? There are so many variations and colors out there. Just trying to get the painting done and I'll show pic's when I'm through. Happy Reds! Enamelware is one of the things I DON'T collect but I LOVE it! I do have an aqua enamel bucket, if I were going to collect it.....I'd go for the white with red trim. It looks so clean and cheerful. You certainly have a nice collection of pieces, lucky you! I love your enamelware, and those three little bears are adorable. I LOVE vintage children's books, too! Before I forget--I love your coo coo clock--I have no idea how to spell it!!! I love red and white enamel wear--I only have a couple of pieces. Your little bear stuff is cute too. Hey, when you show your painted kitchen please remind me to come see it!! I love the enamelware. I collect the white as well as it will go with everything. Have a great day. I just recently bought a yellow with green trim large wash bowl..I'm going to use it to hold reuit in the House on Wheels. I also have a set of cream with green trim..very old..cookware. I do love the stuff..it is soooo durable!! Love the enamelware. I haven't collected any vintage like yours - all mine are fairly new. 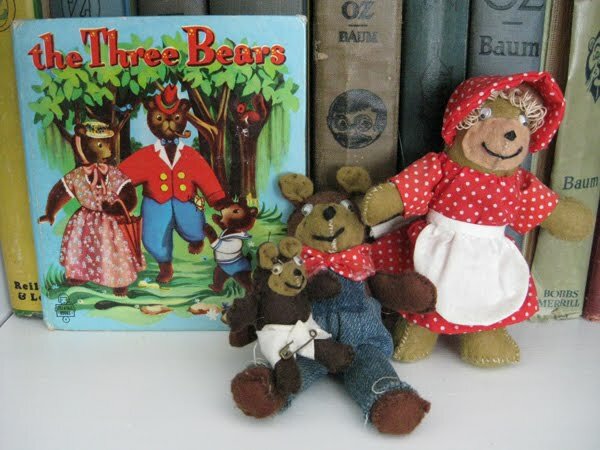 Three bears book and dolls are so adorable. Fun post! Looking forward to seeing that kitchen paint job. I need to do that too! Your collections are so enjoyable, Leslie! I love looking at the things you have so lovingly accumulated and arranged. I don't collect enamelware per se, but back in 1973, shortly after Tony and I met, I was taking him out to celebrate his 24th birthday. Not really knowing him well at the time, and having no idea what to get him, I found a few enamelware pieces--4 plates, 2 bowls, 2 mugs--and gave them to him for his birthday gift. He was thrilled! He was just getting out of the Navy and had nothing but his car and his clothes. We still use the plates and bowls. The mugs developed chips on the insides that made them unsafe to use, but I hated getting rid of them. Thanks for unlocking that old memory! Love your red and white enamel ware!! Hi! Thanks for stopping by. I just got home from work so I can now go skipping thru the Cherry World! I have few enamelware peices I use as planters outside, but I don't really collect them. I hadn't really thought about it. I love the red and white tho. 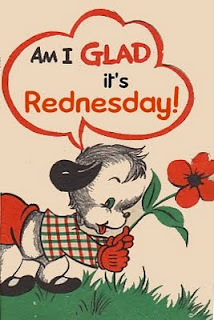 I came to visit for Rednesday and had such a nice time. I even recognized the bear book - We used to have one too. I loved your unique enamelware teapots as well. Very pretty! 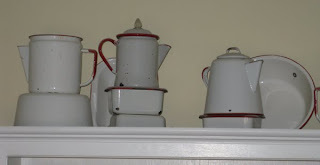 Neat-o enamelware collection, Leslie. What color are you painting in there? Red? I love your cute bears and RED books, so darling, you really have a beautiful enamelware collection. Thank you for visiting and leaving your sweet comment on my Patriotic Door Wreath! I really enjoyed designing this wreath, love the red, white and blue and REDNESDAY! Cute enamel ware collection! I've got a couple of rectangular, deep pans with the red trim. I used to have some blue. It's got such a charming, cottagey look. I love it! Very charming, I love enamelware! For your question. I do sew a lot of my stuff for tables. It's the only way I can do them as I have very limited funds for tablescaping. But, it does make it more fun because I have to get creative! Thanks for coming by, your blog is darling! I love children's picture books , vintage & other wise!The bears are so cute ! I am such a sucker for enamelware! You've got some great ones! The Three Bears book is too precious! Adorable bears and book! I don't have any enamelware, and I like that touch of red on them. I'm a REDnesday participant too, and am just dropping in to say hi. Loving the vintage book, and your blog is adorable with all the cherries. If you visit my blog, you will see why I think your blog is so cute. Hope to visit you again soon. Have a great weekend.